Bald-faced hornets are not actually hornets at all. They are yellow jackets, which are actually wasps. They are very easy to distinguish from other flying, stinging insects (i.e., bees, wasps, hornets). Measuring between 1/2″ and 3/4″ in length, they are very intimidating when encountered. 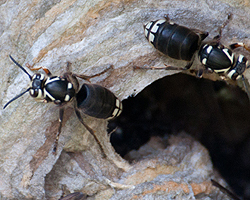 They are black with off-white markings on their abdomen and face, giving them their name of bald-faced hornets. Bald-faced hornets are known for their large, grayish-brown, ball-shaped, paper nest, which they start building in the spring. The nest is made of a pulp derived from chewed up wood fibers mixed with saliva. Nests are most commonly found hanging from tree branches, but they are also found on the sides of houses and under eaves. Usually this is not a problem, unless they have built their nests in close proximity to humans. As the season progresses, the nest grows exponentially. These nests can sometimes reach 3 feet tall, consisting of up to 700 hornets. They are usually not detected until the leaves begin falling, exposing the nest. At the end of the season, the newly hatched queens leave the nest and find sheltered areas (logs, underground, etc.) to spend the winter. All other female workers and all males in the nest die. The nest will never be reused. In spring, the queens emerge and each queen starts building a new nest and the cycle continues. Although not usually aggressive, they will attack anything or anyone that invades their space. Their sting can be very painful and even dangerous to persons allergic to their venom. Unlike honeybees, bald-faced hornets can sting repeatedly. When contact between people and hornets is imminent, due to nest location, extermination of the hornets is often necessary. Under certain conditions it is possible for us to remove these nests safely so that the hornet’s venom can be used for scientific purposes. Please contact our office for more information.